Today's document is fascinating as it is the very first site map envisioned by WDI Imagineers for Disneyland Paris. As you will see below Frontierland is the only land which almost didn't had changes between this first map and the final result. All the other lands had big differences and we're going to have a look to these in details. On this map, which was done in the late 80's and called "Plan X", everything in purple color are attractions buildings. Entertainment and merchandise locations are in blue, covered walkways in orange and transportation systems in light yellow or so. The red lines are park and lands limits. The Main Street USA that we can see on this map was the first 1920's version envisioned by Eddie Sotto. In this version Main Street had a big attraction - number T 900 on the map - and it was the "Hollywood Theater" or "Circlevision meets Main Street Cinema". The Disneyland Hotel had not been thought of yet that's why it's not on this map. The elevated tramway moving outside and inside what is now Main Street Discovery arcade had a station on Town Square - T 400 - and another one on Central Plaza - T 100. Frontierland, as i've said, is quite similar with the one we know. On this map Phantom Manor - W 1100 - is already at its current location, so is Big Thunder Mountain - W 800 - and the Riverboat landing - W 1000 - or the River Rogue Keelboats - W 700 . But there is also on this map something which don't currently exist, it's the attraction building W 400, near the Cowboy Cookout Barbecue location. This was supposed to be a kind of rodeo show. Considering that this is the Cottonwood Creek Ranch area the idea was to have a kind of stunt show which could exist in this kind of place. Later, when they decided to add the Buffalo Bill Wild West show to the Disney Village, this rodeo/stunt show in the back of Frontierland was unfortunately cancelled. Let's have a look now at Adventureland as a big surprise awaits us. Adventure Isle and the Swiss Robinson Tree - A 300 - are already there as well as Pirates of Caribbean - A 1700. But the main surprise is the attraction A 500 as it seems that WDI Imagineers had envisioned to build a Jungle Cruise attractin at DLP Adventureland. Building A 400 was probably the indoor section of the Jungle Cruise. And this other one showing another scene of the cruise in a more "cartoon" style. Fantasyland looks quite similar to the current version. Peter Pan - F 900 - and Dumbo, the Tea Cups or the Carousel are almost at their current location, and same for It's a Small World - F 300. But Snow White and Pinnochio - F 1000 and F 200 - are not together on the same side, like they are now. Also, Story Book Land or Casey Jr are not on the map although "future expansion" is indicated on their location. Note also the other "future expansion" area in front of where is now the Pizzeria Bella Notte. It's the famous "reserved" location for the Little Mermaid ride. Discoveryland is very interesting on this map for many reasons. First Videopolis, Star Tours, or the now extinct Visionarium are not on the map. The Orbitron - D 800 - and Space Mountain - D 400 - are already there as well as the Nautilus - D 650 - but Nemo's Submarine is on the left of Space Mountain and its lagoon was located where is now Videopolis! D 200 and D 300 seems to be two others big attractions but unfortunately i couldn't find what it was supposed to be. But one of the major surprise from this map is the itinerary of the Disneyland Paris railroad. In this version the train station was not located in the back of Discoveryland, but at the entrance of the land! Better than that, it was a major transportation hub as both Disneyland Paris railroad AND the Main Street elevated tramway were supposed to share the same station. In this kind of "ventureport" idea all transports would have be there and it was a kind of gateway to the future, at the entrance of Discoveryland. But the idea did not last very long and artworks of this amazing train station are very rare. However you can see above and below two Tim Delaney renderings showing it. On the night view above you see clearly that the train station is at the entrance of the land as the Orbitron and Space Mountain structures appears behind the train station. On the picture below you can see that the Discoveryland train station was supposed to have two floors and a great architecture to mark the entrance of the land. I've promised you at the beginning of this article a fascinating document and for sure it was one. If we look at it with objectivity, i think it's fair to say that WDI Imagineers did the right choices. They've kept the best and improved a lot the park since this first site map. Still, i regret the 1920's version of Main Street. I think DLP have the best of all Main Streets but something more radically different would have been interesting, too. 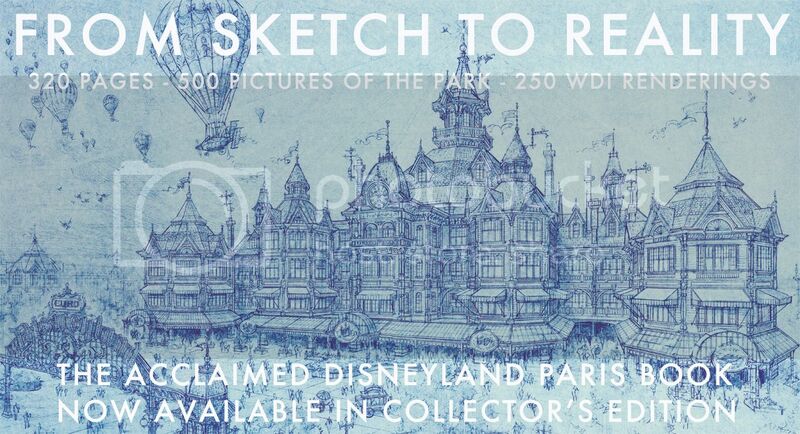 You'll find many others concept arts of the DLP that never was in my Disneyland Paris book and this is what makes "From Sketch to Reality" such a great book! It's a perfect gift for Christmas and with the special pre-order price at 55€ for the new english regular and updated edition, that's one more good reason to pre-order your copy right now. English regular edition will ship in 2-3 weeks from now and collector copies are shipped in the next 48 hours. You'll find below the video showing you each page of the book and to place your order in one click with Paypal use the Paypal button below, with which you can choose between the regular or collector's edition of the book. Please send me also your shipping address by email at: neverlandeditions@gmail.com Note: if you don't have a Paypal account, payments by bank transfer are accepted, thanks to send me an email to have the bank infos. All pictures: copyright Disney Enterprises Inc. I never understood the reasoning behind the Jungle Cruise being vetoed as Tokyo has it and they also get snowy weather in winter. So I may be way off here, but could D-200, or D-300 be part of the "Hyperion Skyway" concept? Did some digging, and found this site that mentioned a skyway concept for Disneyland Paris: http://www.designingdisney.com/content/skyway-disneyland-paris. If you scroll down to the 5th picture you see a zeppelin structure that could be one of those mystery buildings (looks sort of like D-200)? The water and a lot of the details look differently, but if you look over their shoulder, that concept map looks similar to the Plan X map you shared (looks like it has the train station at the entrance to Discoveryland). Again, could be a stretch, but worth considering. Anyway, love your website! Maybe the reason is that the Jungle Cruise and the Tiki Room were both already outdated in the late 80's. I never understood the reasoning for building the Jungle Cruise in Hong Kong.